BMW have announced today (Wednesday) that they are to quit Grand Prix racing from the end of the 2009 season. 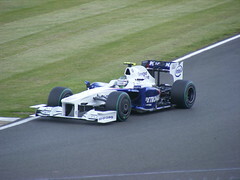 This leaves drivers Nick Heidfeld and Robert Kubica without a drive for the 2010 season. There is currently no news as to the future of Sauber, the previous name of the team before BMW took over operations in 2005 and who still have involvement with the BMW outfit. FOTA (Formula One Teams Association) has vowed to do all it can to keep Sauber in Grand Prix racing. It will be interesting to see if the Sauber name will return to F1 or if the team will be sold on in a similar process as the pull-out of Honda from F1 that led to the formation of the Brawn GP team. Team Principle Ross Brawn has already stated that the creation of Brawn GP was owed in part to the support of FOTA.